The Chiang Mai annals tell the fifteenth century story of two Muaythai champions. In 1411 King Sen Muang Ma died leaving two sons and two claims to the throne. One too many. The sons Yi Kumkan and Fang Ken started a gruelling war for the throne. Neither could get the upper hand and the war dragged on inconclusively. Fang Ken suggested that they follow the traditions of the past and that the succession issue be settled by a single Muaythai combat. Yi Kum kam agreed. Both princes stated that the fight would be to first blood. According to the annals, the bout lasted several hours. The fight looked about even, just like the war but then Fang Ken’s fighter got a small cut on the foot. First blood, Yi Kumkan became king. Some of the legendary champions of Muaythai have been kings. The most famous of these was the ‘Tiger King’ Phra Chao Sri Sanpetch VIII, the 29th King of Krung Sri Ayutthaya. Khun Luang Serasak, as he was known before he was crowned, was the of Phra Petraja the founder of the Ban Plu Luang Dynasty. 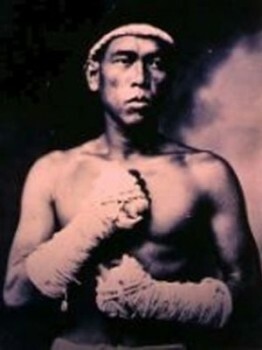 His son became known as Phr Buddha Chao Sua or the ‘Tiger King’ because of his ferocity as a Muaythai fighter. During the reign of the Tiger King, Muaythai saw one of its golden ages, not least because of the King’s interest and patronage. Every soldier trained in the art. Being a good Muaythai fighter was a way to military advancement. The King himself was an ardent exponent of art. But the fighter did not want to defeat him and instead took a dive as soon as possible. Not necessarily an ill advised action, as to even touch the king resulted in execution. So the Tiger King had a problem: Did he win his Muaythai bouts because he was King or because he was a great fighter? His test came when one of his court mentioned that there was a temple fair at Ban Pajanta in the Viset Chaichan district. Whenever there was a celebration, there would be boxing matches. The next morning, the King took his entourage and travelling by river, went to the fair. From Tambom Kruad, he went on foot in disguise to the village. The King was a visiting boxer from the city accompanied by his aides, manager and trainer. The ‘Tiger King’ soon spotted the boxing ground and sent an aside there to arrange a fight. The promoter wanted the boxer to weigh in so that he could create a good, even match. But the King refused saying that he would fight any boxer regardless of weight and size. He wanted, he said, to fight the local champion. Records say that the fight that ensued was an exciting and skilful contest between two talented fighters. The ‘Tiger King’ though, soon struck the blow that led to the local champion’s defeat. The ‘Tiger King’ was awarded the prize money of one baht-about a nickel-and the loser 50 satang, half a baht. He then asked for more fights. The promoter didn’t argue and arranged more fighters to box with the King who defeated them all. The ‘Tiger King’ continued to fight and beat the Kingdom’s best, an unknown fighter from the city who pitted his skills against all comers.